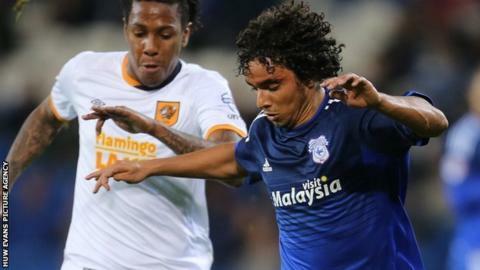 Defender Fabio is set for a return from injury for Cardiff City's Championship game at Bolton Wanderers on Saturday. The Brazilian international full-back, 25, has been sidelined since sustaining a foot injury in the goalless draw at Ipswich Town on 31 October. A scan revealed ligament damage which kept the former Manchester United player out for over a month. ''I can't wait to be back, actually. I really want to help," Fabio said. Fabio, who joined from United in January 2014, had been having his most consistent spell with the Bluebirds when injury struck. ''It was very frustrating. I was playing good and playing every game.," he added. "But I am recovered now and want to be back on the pitch. Fabio watched Saturday's 2-2 draw with Burnley, who hit back with two goals in the dying minutes to earn a point.